Both railway and road transport ministers on Wednesday said the government has taken all the necessary steps to ensure smooth journey of the homebound people ahead of Eid-ul-Fitr. Talking to journalists after visiting Gabtoli Bus Terminal, Road Transport and Bridges Minister Obaidul Quader claimed that people’s eid journey is more comfortable this year than any other time in the past. “There’s no problem in roads, railways and waterways and the situation is very good,” he said. Quader said he himself is taking special care to ensure a smooth journey of the home-goers to celebrate the festival with their near and dear ones as confusion was spread over the road condition. The Road Transport and Bridges Minister said no passenger also complained of charging extra fare from them by the bus operators. He said sterna action will be taken if he receives any complaint from any passenger about charging extra fare and any incident of extortion on highways. 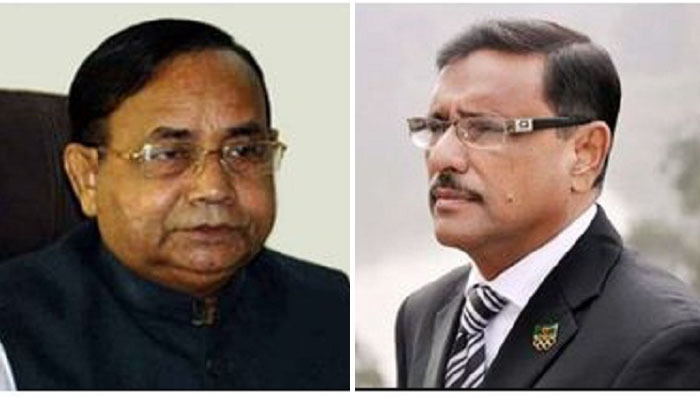 Quader claimed that the traffic is very smooth on the Dhaka-Chattogram highway but there is a little problem in the journey to the northern region due to slow pace in ferries at Paturia ghat amid bad weather. Railways Minister Mazibul Hoque said the government has taken steps so that homebound people can return to their respective cities after celebrating Eid-ul-Fitr with their families and friends smoothly. “The government is putting in its best efforts to provide the best services to passengers,” he told reporters at Kamalapur Railway Station in the city. The Railways Minister said the government cancelled the leave of railway staff to make homebound passengers’ Eid journey smoother. Earlier, he saw off the passengers of two trains – Rajshahi-bound Silk City and Chattogram-bound Suborno Express – from the station. Some 30 trains left Kamalapur for different destinations till 3pm on Wednesday, said a PID handout. Of the trains, two trains were delayed to some extent while the rest left Dhaka timely. Mazibul said a total of 94 trains will run on various routes. Senior railway officials were present.